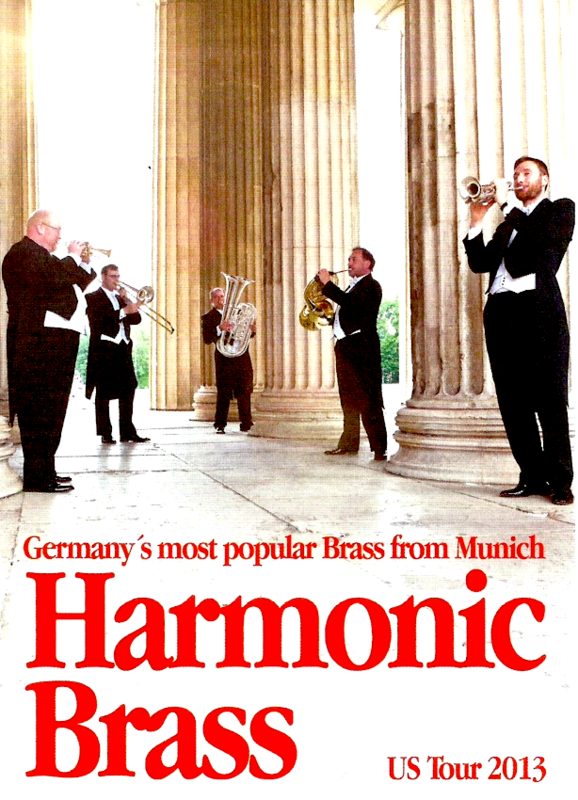 At 7:30 p.m., September 20, 2013, Crescent Concerts welcomes Harmonic Brass, Germany's most popular Brass from Munich, as part of the regular Crescent Concerts Season. Price is $20 (Seniors $15 / Students $5). Doors open at 7 p.m. The American audience can look forward to a brand new concert program. With Harmonic Brass, the five gentlemen from Munich will present exciting brass chamber music at its best. The great European Composers J.S. Bach and G.F. Handel are just as represented as the legend of Tango - Astor Piazolla. With fragments from West Side Story, the musicians also will bow to the famous American composer Leonard Bernstein. The international press celebrates Harmonic Brass for its large but elegant ensemble sound, sophisticated choice of music, and stunning stage performance. Their legendary at Carnegie Hall New York also is well remembered. From September 19 through October 8, the ensemble will tour New Jersey, New York, Pennsylvania, Ohio and Kentucky with 17 concerts and two master classes at universities. Harmonic Brass is wellness for your ears. Don't miss this sound!